The third speaker asked for money for renovation of the Civic Center. The fourth wanted increased spending on the courthouse. That fourth speaker, T.J. BeMent, court administrator for the 10th Judicial Administrative District of Georgia, produced the only surprise of the evening. BeMent told the Board of Commissioners that the $2.7 million it is considering for courthouse security improvements from the 2004 SPLOST may not be enough, and additional money may need to be taken from the 2015 SPLOST. County Administrative Officer Jeff Benko gave an overview of SPLOST requests and of the tentative agreement the Commissioners reached on allocations at a meeting on March 3. Benko then opened the floor for comments from the audience. 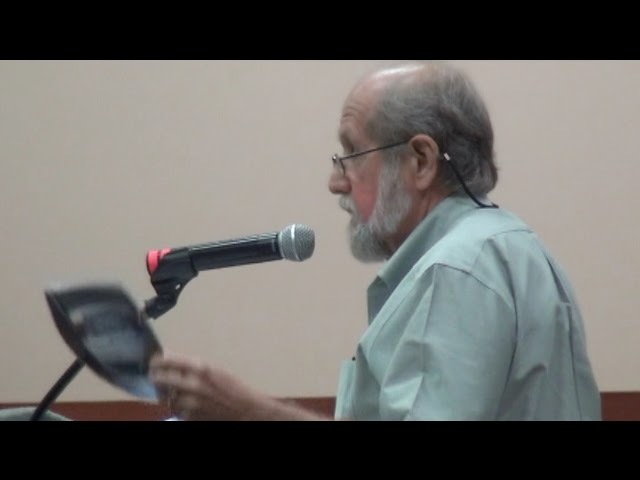 Robert Wyatt, a member the Library Advisory Board, made a plea for spending for the county’s libraries, repeating arguments he has made in earlier SPLOST hearings. Russ Page, a farmland and historic preservation advocate, made an impassioned plea for an increase in funding for farmland protection and for inclusion of money for preservation of historic sites in the county. The BOC at the meeting on March 3 cut Page’s request for farmland protection and denied entirely his request for funding for historic preservation projects. Shane Hannon, representing the Oconee Youth Playhouse, argued for renovation of the dressing rooms at the Civic Center. The BOC has indicated it is interested in spending between $1 million and $2.5 million on the Civic Center. BeMent thanked the Board for including $475,000 in its tentative spending plans for judicial court technology. But BeMent said that the request that Judge David Sweat, chief superior court justice for Oconee County, had made for a $25 million new courthouse or judicial facility was a serious one. He said that he soon would be asking the BOC for money to study more closely the security needs for the courthouse, given that the BOC has indicated it does not want to put money into a new courthouse at this time. The next chance citizens will have to voice their preferences on projects to be included in the November referendum on the 1 percent sales tax will be at 6 p.m. on May 12 in Courtroom Number 1 at the courthouse in Watkinsville. Tonight’s meeting was held at the Civic Center. It lasted just less than 40 minutes.